The more I think that being north of 100 episodes means I’ll start to run out of BIG names to get on the show..the more I realize thats absurd. 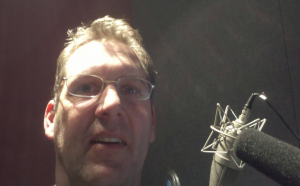 John Pleisse is a major player in the voiceover world especially when we talk in terms of Radio Imaging AND TV Affiliate work. He is heard in the largest markets on varying formats in radio and while primarily on NBC affiliates across the States he is also on other networks and cable channels etc. Basically, if you have functioning ears and are in ‘merica — you’ve heard my guest. And what a humble, sane, honest individual John turned out to be. I slaughtered my intro with him (so I think I cut most of it out) but he is one of the guests that I had never had contact with in the past. We weren’t friends and never even emailed. I never know how these shows will go but clearly from my limited interaction with John he’s a guy you want to know and would be excellent to work with. Hit his site below for in-depth, longer demos (audio and video) or just hit play as I give you a condensed 1:45 full scale demo of some of his work to kick things off.